Amaal Tulaimaat is the daughter of Rose Al-Yousef, the Arab world's first woman journalist, whose magazine carries her name to this day. In an exclusive wide-ranging interview, Amaal recalls a woman who broke new ground and did so much for her country's independence. "My mother had lived through bitter times," says Amaal. "Her mother died in childbirth and her father was a tradesman who went off to Brazil leaving her in the care of friends. One day all news of him suddenly stopped." When she was seven, she ran away to Cairo deprived of a mother and father. She somehow strayed toward a theatre she was struck dumb by this world with its bright lights and beautiful people. It was there that the producer and actor Aziz Eid approached her. He taught her to read and write. She followed him wherever he went and would not leave his side. When Rose was fourteen years old, all the actresses in the company refused to play the part of a very old woman, so Aziz Eid trained her for the role - her daughter on stage was 30 years her senior. The play was a great success and offers of more parts flowed in. Within a few years she became the star of the group with a 25-pound salary. She retired from acting in 1925. She was very quiet, she would blush when complimented. Her voice was soft and low like a girl's. She preferred s solitude and isolation. She was compassionate, but she was sometimes extremely strict, especially with my brother Ihsna who became a famous novelist. Ihsan flunked his exams when he was 19 years old, so she traveled to Alexandria where he was and hit him and dragged him home. Another time, Ihsan - then married with children - disagreed with her, and she kicked him out of the house and did not talk to him for a whole year. 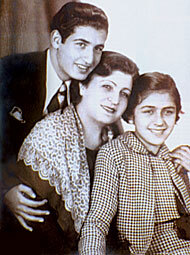 Before my father, my mother was married to the engineer Muhammad Abdulqudus who had decided to become an actor. He ran away after she got pregnant. The divorce happened after she had Ihsan, who is four years my senior, in 1919. At that same time a strong friendship had developed between my father Zaki Tulaimaat and my mother. They had met during an acting competition, and they later married. The Ministry of Education sent my father to Paris on a four-year scholarship to the Comedie Fancaise. When he came back there were problems because he's had a few publicized liaisons. They separated when I was nine years old. It wasn't a divorce, and his friendship with my mother didn't end. He used to take me to school with the driver every day and until I was 13. After my mother retired from acting, she applied for a license for a magazine, and that is how she came to journalism - with only five pounds in her pocket. Friends of my father's and famous singer Um Kulthoum helped her. And an entire "family" or editing team worked without an office, without salaries and without rest. My mother taught herself the principles of politics. She would be enthusiastic about each and every protest that called for independence and an end of the British occupation. Her art magazine became a major political magazine speaking for her and her country. She entered the political arena alone, without backing by any party, without being financed by any governor. Rose Al-Yousef refused bribes and several offers to stop her campaigns. The Ministry, the Palace and the British started fighting her. Other newspapers were also against her, and students marched in front of her house to support her. But her license was canceled, so she had to start over and apply for a new license under the name The Shout. There were 42 issues of The Shout before Rose Al-Yousef magazine returned anew. My mother was the first woman to go to jail for independence in Egypt. It was a day I remember, because I cried non-stop from the moment they arrested her until she came back. It hadn't been an hour before friends and visitors arrived at the jail. She was the talk of the town. Foreign newspapers started a campaign to get her freed, and under pressure they had to let her go the next day and dropped all the charges. She came back more determined, stronger and more committed than ever before.